The origin of the current conflict in Darfur that began in the early 1980s can be traced to two major developments. (i) Since Sudan became independent, Darfur has suffered from negligence of power sharing and lack of development by successive Governments that failed to address the genuine constitutional procedures for the country and the economic disparity between the region and the rest of the Sudan. (ii) The policy of deliberate marginalization caused Darfurian people to establish political organizations in the late 1950s and in the mid-1960s, demanding economic development for the region and political representation in the centre. But instead of addressing the negligence and its associated injustices, the Governments plunged the region into inter-ethnic conflicts, thus the ruling elites in Sudan (the Riverian Arabs) have been successful in implementing their policy of divide and rule in Darfur. To that end the Sudanese Government’s adopted policies of by-proxy war in Darfur, hence genocide, ethnic cleansing and earth scorching has become a common practice by the Khartoum regime in Darfur (using Arab militias “Janjaweed” against African indigenous tribes). Sudan Liberation Movement/Army (SLM/A) took up arms against the Government of the Sudan (GoS) in protest at the perceived lack of government protection against attacks on sedentary groups, thus SLM/A has been created in response to those challenges and the general policy of marginalization and deprivation by Khartoum Governments. Sudan Liberation Movement/Army -Abdul Wahid- (SLM/A-A) is aware that the current conflict in Darfur is of political nature and cannot be resolved through military means. It recognizes that a deal can only be achieved through negotiated political settlement to ensure a lasting peace, but the deal on the table at Abuja was not the right deal. The political movements in the recent history of Darfur include (1) The Red Flame (Al-Laheeb Al-Ahmar) established in 1957. This was an underground movement established just one year after the independence of the Sudan, with the main objective being to enlighten the people of Darfur about the negligence using hand written leaflets. (2) Sooney Movement of 1963/64, which was lead by Darfurian army veterans who fought in the civil war in Southern Sudan. They came back to Darfur convinced that the civil war in this part of the country is illegal and immoral, and they established their own movement in Darfur to address the issue of marginalization. (3) Darfur Development Front (DDF) established in 1964/65. The main objective was to demand economic development projects and the independency of political decisions from the Centre. DDF still has some active members in the field of regional development. (4) Western Sudan People’s Organization (WSPO) 1977/79, an opposition movement established in Diaspora, it become a member of the National Front which opposed Nemeiri’s Regime in the 1970s. (5) Darfur Popular Uprising of 1980, which was a popular uprising held in El Fasher, the historical capital of Darfur, to protest against the appointment of an outsider as Governor of the Region of Darfur. (6) Darfur People’s Demonstration (Khartoum), 1988, another popular demonstration in the heart of Khartoum protesting against Government policies which allowed troops from foreign countries to fight in the soil of Darfur. (7) SPLM/A led by late Dawood Yahya Boulad in 1990/91, which was an expansion of the SPLM/A in Darfur. (8) Sudan Federal Democratic Alliance (SFDA) of 1994, established by western Sudanese in Diaspora to replace the opposition group of the National Democratic Alliance and to advocate for a different, more stable and inclusive political system so as to address the very problems which brought about the current conflict and the fall of the previous national governments. And (9) the Sudan Liberation Movement/A (SLM/A), and Justice and Equality Movement (JEM) both appearing in 2003. Both Movements are calling for a New Sudan and aiming to address the root causes of the conflict and the constitutional issues such as the system of governance, Human rights, separation of religious and political affairs, just and fair economic development for the marginalized areas. Thus it is obvious that the present movements evolved from natural and continuous resistance to the deliberate marginalization and negligence of the region. The SLM/A is fully convinced that the current conflict in Darfur is of a political nature; therefore it can only be resolved through peaceful negotiation. Accordingly, it accepted and attended all rounds of the Peace Talks to negotiate with good faith on the grounds that the negotiation will address the root causes of the conflict in Darfur in order to reach a fair and just agreement which would smoothly be implemented by the parties who will sign it, and ultimately this agreement would lead to a sustainable peace in the region and the country at large. The process of the Inter-Sudanese Peace Talks on the conflict in Darfur started as early as May 2001 in Darfur, even before the SLM/A declared itself by this name. Since then till December 2002, a total of 5 meetings of Peace Talks were held between the Government of Sudan (GoS) and the Movement in different places in Darfur, mainly in El Fasher and the Jabel Marra area. In all these meetings the Movement put forward on the negotiating table three main issues for discussion. These were (i) Just political representation in the region and the centre (ii) Fair economic and social development in Darfur and (iii) Cessation of divide and rule policies by inciting some tribes against others. Then after the Movement declared itself officially in early 2003, another 3 meetings were held and the demands were upgraded. It is worth mentioning that in all these rounds the GoS has rejected all demands put forward by the Movement, refusing to admit that this is a political conflict, instead the GoS continue describing members of the Movement as armed robbers, bandits, or describing the conflict as a tribal one. In September 4th, 2003 the venue of the peace talks was moved to Abeche (Chad), so the solution of the conflict was internationalized. The first round under the auspices of African Union (AU) Mediation was in April 8th, 2004 in N’Djamena (Chad) where a ceasefire was signed. After that an agreement on the modalities for the establishment of the ceasefire commission and deployment of observers in the Darfur was signed in Addis Ababa (Ethiopia) on 28 May 2004. The following six successive rounds were held in Abuja (Nigeria) where two Protocols on the (i) Implementation of the Humanitarian Situation in Darfur and (ii) Enhancement of the Security Situation in Darfur, were both signed in November 9th, 2004, and in the following year the Declaration of Principles (DoP) for the Resolution of the Sudanese Conflict in Darfur was signed on July 5th, 2005. 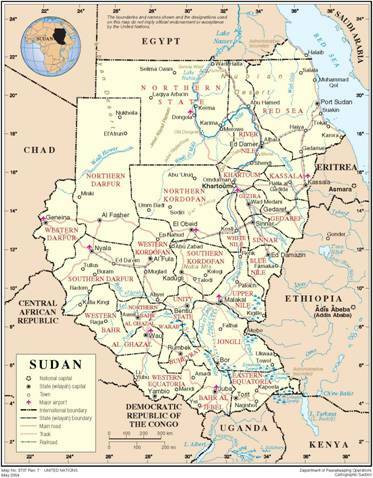 The issues of discussion in the DoP can be classified into three categories (i) recognition and accommodation of the fact that Sudan is a composition of multi-ethnic, multi-religious and multi-culture society; affirmation of rights such as tribal land ownership and other historical rights of Darfur; human rights and citizenship as the base for civil and political rights and duties. (ii) Continue negotiations on other issues such as power-sharing, wealth-sharing, sustainable development; rehabilitation and reconstruction of Darfur, humanitarian assistance, security arrangement …etc, and (iii) the agreement reached by the parties shall be incorporated into the National Constitution. (1) The AU Mediation had decided to classify the negotiation process into three commissions: Power Sharing, Wealth Sharing and Security Arrangement, and further decided to proceed in the negotiations of these Commissions in a concurrent manner. The main concern of the Movements was that this procedure would create great confusion and would not lead to fair results, e.g. lands in Darfur constitute a critical issue for Darfurians, it is highly valued as political power and a source of generating wealth, not only the fact the current conflict is basically over land. Therefore, any discussion over the land issue in the three Commissions should not be in a concurrent manner, it should be negotiated in first place in one Commission, preferably Power Sharing in order to establish a reference to the other two Commissions. The same is true of the issue of the Darfur Region. (2) The AU Mediation concluded in February 2006 that there is no need for more plenary; accordingly they decided to produce one compiled document for the Parties to sign. Since then there were no formal negotiations, particularly in the Wealth Sharing and Power Sharing Commissions. As a result there were many issues in all Commissions left out. The legitimate question is on what basis the Movement has to sign an agreement which it did not participate in discussing? (3) The compiled document was prepared 6 weeks before it was presented to the Movements on 25th April 2006, but it was kept in AU drawers, and then presented to the Movements when they were given just 5 days to respond and sign it. Bear in mind that there were issues that had not previously been discussed at all. (4) The AU Mediation proposed the formation of a core team from all Parties to be locked up in a separate place for a few days to resolve the issues of difference, or at least put them in a compromise formation for making a decision, but though the Movements accepted the proposal, sadly it was not given any chance. (5) Darfur Peace Agreement is very important to the whole nation and to the people of Darfur, in particular as it can shake up the political and economic future of Darfur. Because of that the Movement had officially requested the AU Mediation to grant it three weeks to carefully study the document before presenting its comments. The Mediation team rejected the request, which shows another indication that AU was adamant not to reach a genuine agreement. B- Legal: The following procedures being followed by the AU Mediation are considered illegal in the viewpoint of the Movement. (1) The compiled document presented to the Movement on 25/4/2006 was not complete as it lacked at that date implementation modalities in all Commissions, and also three crucial issues were not discussed at all, the implementation mechanisms, general provisions and guarantees. Above all the Movement had been given an ultimatum of five days to sign the document or leave it, and this is clearly against the prevailing understanding of negotiation norms worldwide, which allow the parties to negotiate every issue and reach a compromise position where everybody can be a winner. (2) In the case of such agreements, definitions of key words and phrases are of paramount importance as they directly affect the implementation of the agreement. However, the Movement realized that some words were not correctly defined; this will adversely reflect in the interpretation during the implementation process e.g. Janjaweed, Hawakeer (communal land ownership rights) and Massaratt (Livestock routes). (3) This Agreement gives GoS (National Congress Party, NCP) absolute power to rule Darfur; it got 81% of constitutional and executive posts (State Governors, Ministers, Commissioners …etc) and 71% of legislative seats in Darfur. This means that in the eyes of the international law the licence of implementing this agreement is completely under the control of the NCP, and let us remind ourselves of the fact that this Government is accused by the international community of committing genocide and ethnic cleansing in Darfur, and many of its senior members including Officials from Darfur are suspected by the International Criminal Court of committing crimes against humanity and war crimes. So how can such a Government implement an agreement aimed to bring peace and stability to the region? (4)There is clear legal offence by the AU Mediation in terms of the deletion of some issues already agreed upon by the Parties in separate commissions e.g. in Wealth Sharing Commission Article 21 URGENT PROGRAMS FOR INTERNALLY DISPLACED PERSONS (IDPs), REFUGEES AND OTHER WAR-AFFECTED PERSONS AND COMPENSATION FOR WAR-AFFECTED PERSONS there are paragraphs and sub-paragraphs completely deleted (i) a total of five paragraphs under sub-title Definitions were deleted (ii) the underlined part of paragraph 205 was deleted “205. Taking note of the suffering of the individual people of Darfur, and the customary practices of tribal restitution in Darfur, the Commission shall work out principles for appropriate restitution or other compensation for individuals, communities and economic entities. In doing so, the Commission shall take into account, among other considerations:” and (iii) also in paragraph 207 Sub-Para “207 (i) Satisfaction, including public apology” was deleted. The most critical point was that many paragraphs of 25/4/2006 Document were deleted in the 5/5/2006 Document. A good example is under Definitions. Almost all words and phrases related to Wealth Sharing and Power Sharing Commissions were deleted and in particular those critical words like Hawakeer, Janjaweed and Massaratt, even though their initial definitions were not acceptable in the first place. (5) It had been agreed that all documents should be originated in the English language and that Arabic and French copies had to be translated from it. However, the Arabic version was not correctly translated in many parts e.g. the Wealth Sharing Commission indicates that IDPs and Refugees have no rights for compensation; also the word Commission translated to give the meaning of committee and in that sense Compensation Committee shall be established rather than Compensation Commission, which is precisely what was meant by the negotiating Parties. C- Technical: The security and humanitarian situation has dominated the technical side of the negotiations, in that the AU Mediation adopted the agenda of the International Community, aiming to achieve (i) safeguard the CPA (ii) help to get Sudanese Government approval to bring UN troops to Darfur and (iii) help to bring sufficient aid to the needy people. Therefore, less attention has been given to the Power Sharing Commission, which meant to resolve the root causes of the conflict in Darfur. (1) There were three issues out of nine in the agenda of the Power Sharing Commission which were not discussed at any level of the negotiation process and they are General Provisions, Implementation Mechanisms and Guarantees. (2) There is no inclusion of solutions to the root causes in this Document, and these are mainly of political nature (i) Darfur as one region with its borders of 1/1/1956. The sole objective of the ruling elites in Sudan (Riverian Arabs) is to destroy the culture and identity of Darfur. The reaction from the people of Darfur to that objective was to take up arms against such damaging policies. In the DoP there is a paragraph that says…Tribal Land ownership” hawakeer” and other historical rights shall be affirmed within their historical borders… this principle has not been achieved in the DPA. (ii) Fair representation in both legislative and executive bodies at a national level and majority representation of the Movements at a regional level in both legislative and executive organs during the interim period. (iii) Participation of Movements in the process of disarming the Janjaweed with a specific timetable and effective guarantees. (3) Some essential rights of Darfurians were not sufficiently addressed (i) Individual compensation where the GoS shall put immediately after the signing of the DPA a significant amount of money into the Darfur Compensation Fund (ii) The duration of the interim period (iii) Movements shall control their forces over the interim period before the UN Disarmament, Demobilization and Reintegration programme (DDR) takes place. (4) The implementation of this kind of agreement is the responsibility of the parties who sign it; therefore the representation of the parties should be in a fair and just manner. In the DPA the Movements are represented by only 19% in Darfur’s executive organs, and by 29% in its legislative bodies. It is clear that those who took up arms against the Islamic ideologist government in Sudan have no room in the governing process of their own region to correct the injustice practices and elevate the suffering of their people. (5) There is no provision in the DPA to allow a UN Peacekeeping Force in Darfur after the signing of the Agreement. (1) The SLM/A competent under the control of Abdul Wahid includes Jebel Marra, West Darfur, South Darfur and a significant part of North Darfur. In addition almost all members of the Fur tribe are supporting Abdul Wahid’s side of SLM/A-A; therefore it is important to bring this group on board the peace process by looking again at their demands and addressing them in a genuine manner. (2) The demonstrations in protest of the DPA carried out in the IDP Camps in Sudan, Refugee Camps in eastern Chad, and students in Khartoum, saw 8 persons killed in the month of May 2006 alone, under the brutal treatment of GoS’s security services; sending crucial signals to the world that this Agreement does not satisfactorily address peoples’ demands nor fulfil their rights, so it will not bring peace to Darfur and Sudan at large. Therefore, it is high time to reconsider it, and that will be a brave and great decision for the International Community to take. (3) Issues of land and region are inseparable and constitute the core of the conflict in Darfur; accordingly priority must be given to address these issues if a genuine resolution to the conflict is considered a real target to achieve. (4) The fact that Sudanese politicians have failed to resolve the root causes of the problem in Sudan i.e. constitutional issues. If the present conflict is not resolved in a way that it might please the majority of Darfurians, new military and political movements will arise bearing more radical ideas, which may not be in favour of everybody. (5) As far as a UN Peacekeeping Force is concerned, which should come as soon as possible with a full mandate to use all necessary means to protect civilians and react rapidly to ceasefire violations or provocations by any party, to do this properly it is advisable to include among these forces a sizable number of European and North American soldiers as they are better equipped and professionally disciplined, and above all they are better respected by the GoS and its associated Janjaweed militias. (6) AU Mediation has proven incompetent of conducting the Darfur Peace Negotiation; therefore, an experienced organization like UN or IGAD is needed to carry out future mediation processes in order to reach a successful peace settlement in Darfur. (7) Darfur – Darfur Dialogue and Consultation is meant to brief people of Darfur and get their support during the implementation of the peace agreement, but not to give them the right to reopen the negotiation nor responsibility of implementation. It is advisable to be understood in this context, rather than assuming that it might come up with a new agreement. This Dialogue is the first step towards inter-tribal reconciliation and ultimately peaceful coexistence in the region. (8) Unless the Government admit that the current conflict in Darfur is political, we can not reach a peace settlement, not only in Darfur but in the whole country. the Government is still adamant to manoeuvre around this, it may encourage most Darfurians to take up the demand for self-determination.